The Quote Rotator Small is a left or right column sized qoute or information rotator.. we call it a Quote rotator, but really, it just displays a snippet of text for a few seconds, then another, and so on.. In this tutorial, we’ll demonstrate how to add or remove quotes from the rotator and add and remove the Quote Rotator Component from pages. Something new we’ve added to our Bootstrap themed templates is the ‘Design View’ Quick Edits option. 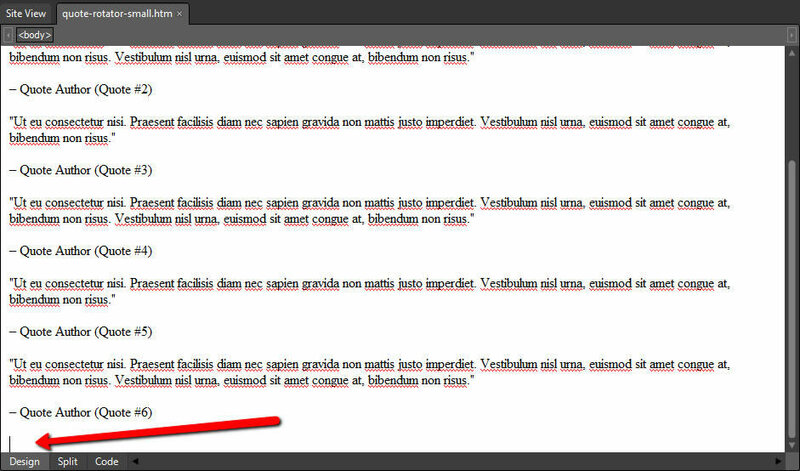 As you’re working in your page, you’ll now see a Component ‘Quick Edit’ placeholder image. To quickly open the Accordion Panel Library page for editing, just right click on the placeholder image, and select Open file:/// .. your Library page will open, and you can quickly edit the content. First, locate the component placeholder in your page. You components Library page will open in a new window, ready for editing. Open the page you want to remove the Quote Rotator from. Locate the ‘Quote Rotator’ placeholder in the Design View of the page. 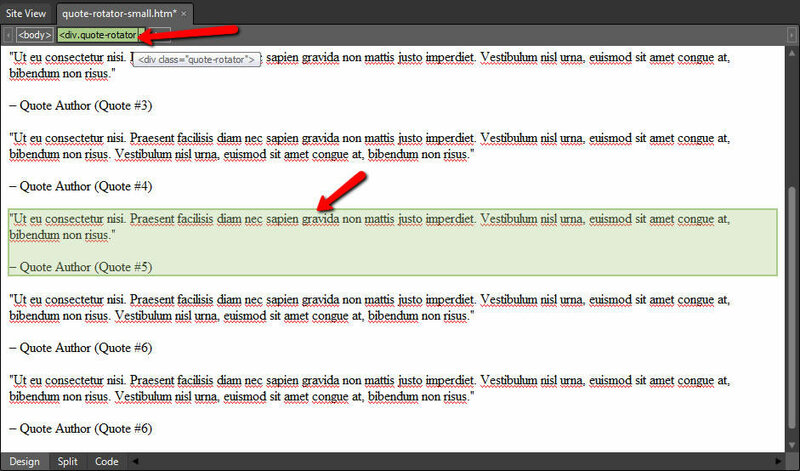 Click the ‘placeholder’ first, then click on the <div.quotes-rotato…> tag, in the ‘Quick Tag Selector’ toolbar. Press the Delete key, on your keyboard. 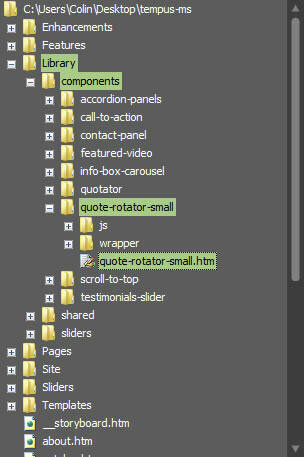 Expand the Library / components / quote-rotator-small (folder). Double click on the ‘quote-rotator-small.htm’ to open. The Library page starts with the H2 title, you can update this, or just delete from the page if you like. To update an existing quote, just select the text in the page, and edit or type in place of / over top of as you would a regular web page. 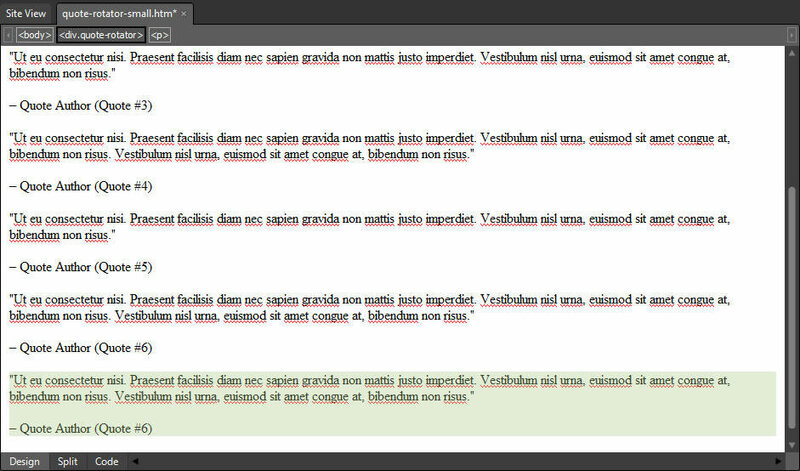 Same with the [ – Quote Author (Quote #1) ] you just type over, or in place. Click on the text of the existing quotes in the page. 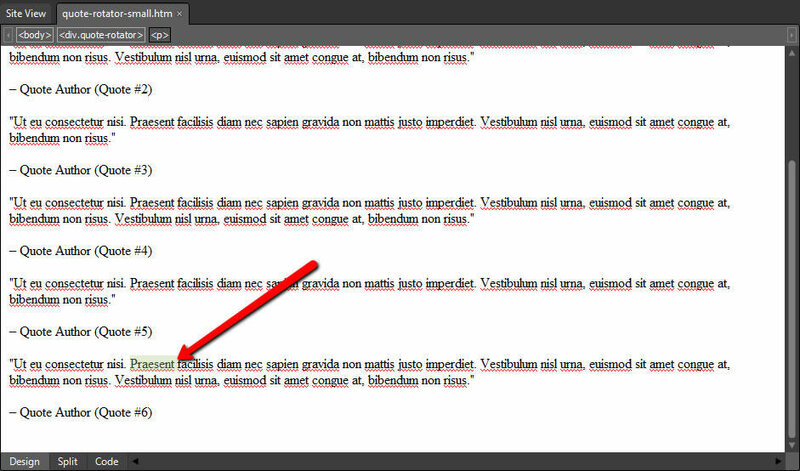 Then click on the [ <div.quote-rotator> ] tag, in the Quick Tag Selector toolbar to select the entire quote. 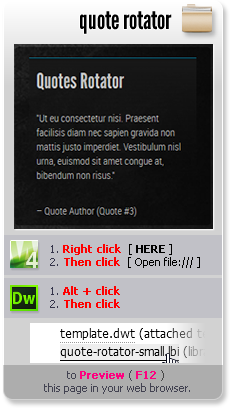 Right click on the selected quote, and Copy ( or Ctrl+C ). 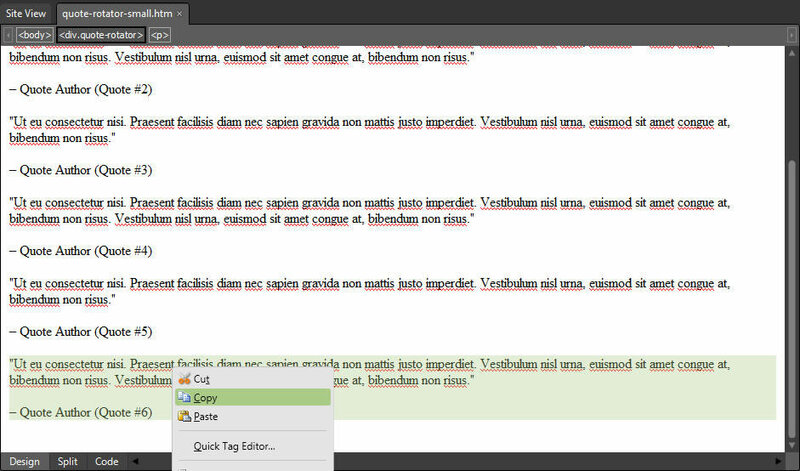 Place your mouse at the bottom of the page, right click and Paste ( Ctrl+V ). Now edit the newly copied and pasted quote. Click or select any of the text in the quote you want to remove. 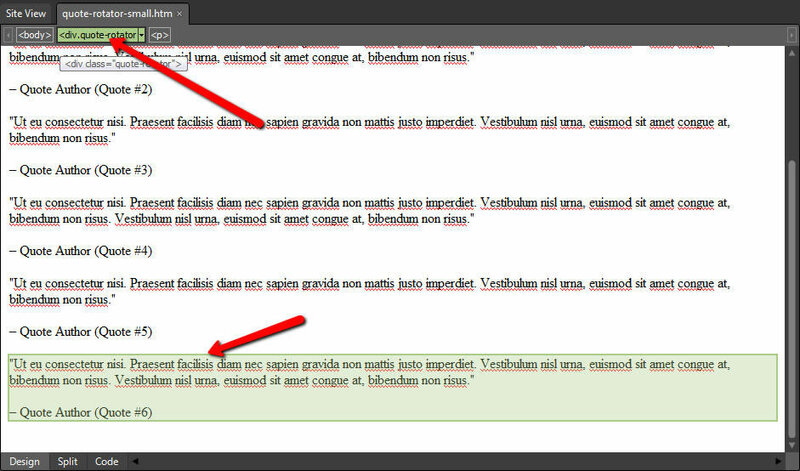 Click on the [ <div.quote-rotator> ] tag, on the Quick Tag Selector toolbar to select the entire quote. The quote will now be highlighted in green, and wrapped in a darker green border. Something new we’ve added to our Bootstrap themed templates is the ‘Design View’ Quick Edits option. 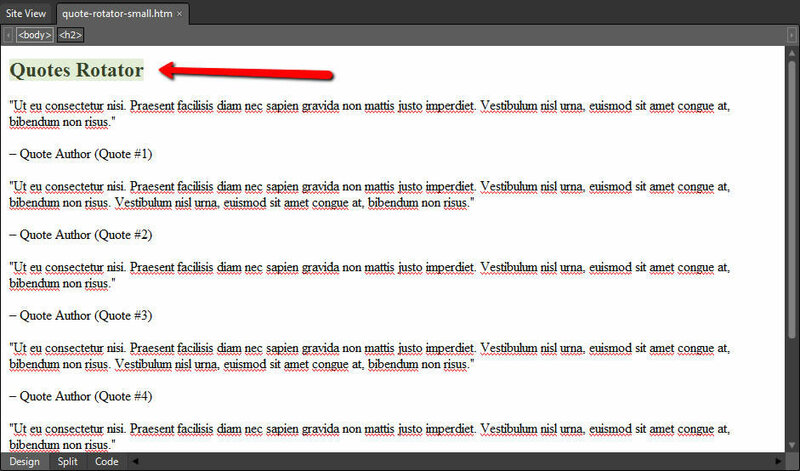 As you’re working in your page, you’ll now see a Component ‘Quick Edit’ placeholder image. To quickly open the Accordion Panel Library page for editing, press and hold the ( Alt ) key on your keyboard, while you click on the ‘pladeholder’ image, then click on ( quote-rotator-small.lbi ) .. your Library page will open, and you can quickly edit the content. 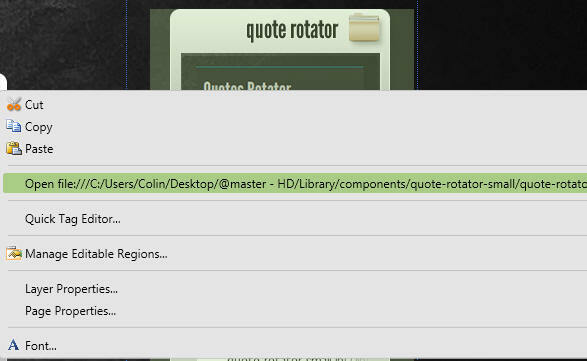 Locate the ‘Quote Rotator’ title in the Design View of the page. 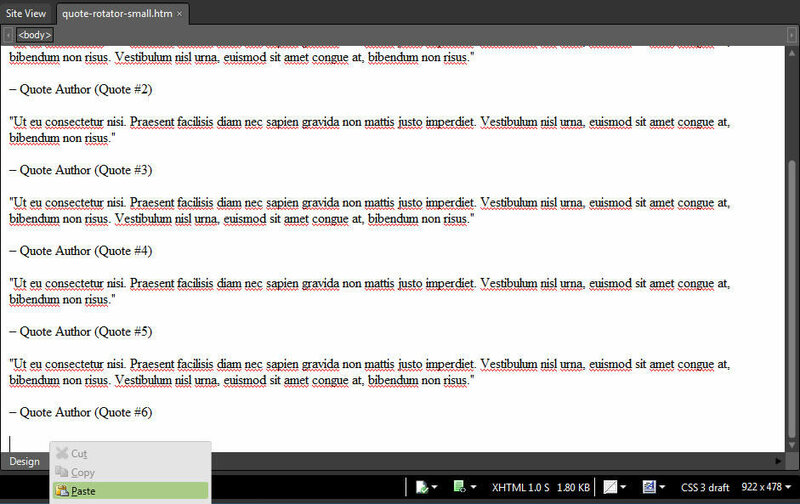 Click the title ‘Quote Rotator’ to select the component in the page. Click on the <!–webbot–> in the Quick Tag Selector toolbar, to make sure you’ve selected the entire component.